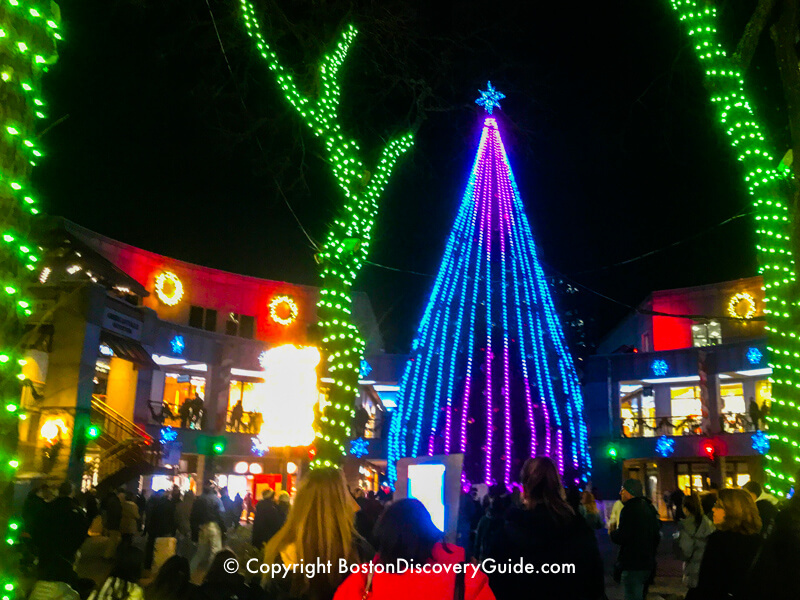 Boston's festive Christmas tree lighting ceremonies start in late November and by early December, the city sparkles with glowing lights. If you have the chance to attend one of these festive events, you'll enjoy the magical moment when the beautiful lights suddenly brighten the winter darkness. In addition, many ceremonies feature entertainment, appearances by Santa, and perhaps refreshments and singing traditional and popular holiday songs. 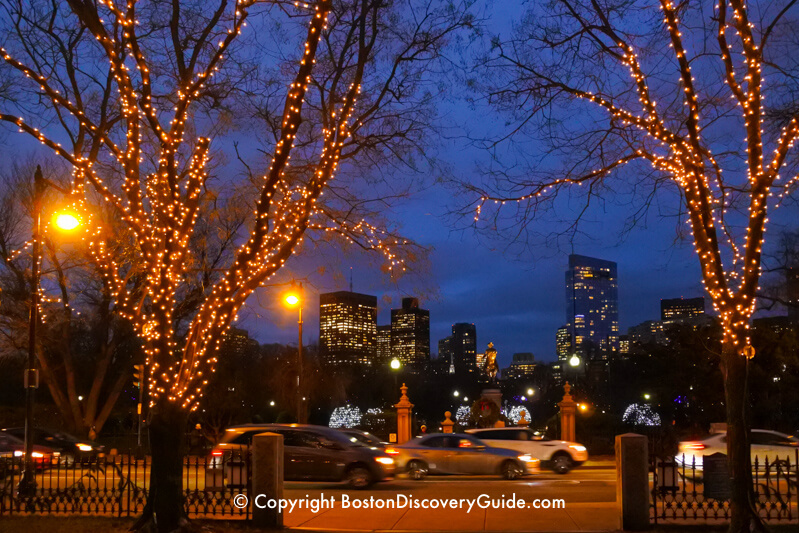 By the time the last lighting event takes place, holiday lights glow across the city, covering not only the largest Christmas trees but also hundreds of trees in Boston Common, the Public Garden, Commonwealth Avenue Mall, Copley Square, Prudential Center, the North End, Downtown Crossing, and along the Seaport waterfront. Please note: Dates/times below will be updated for 2019. 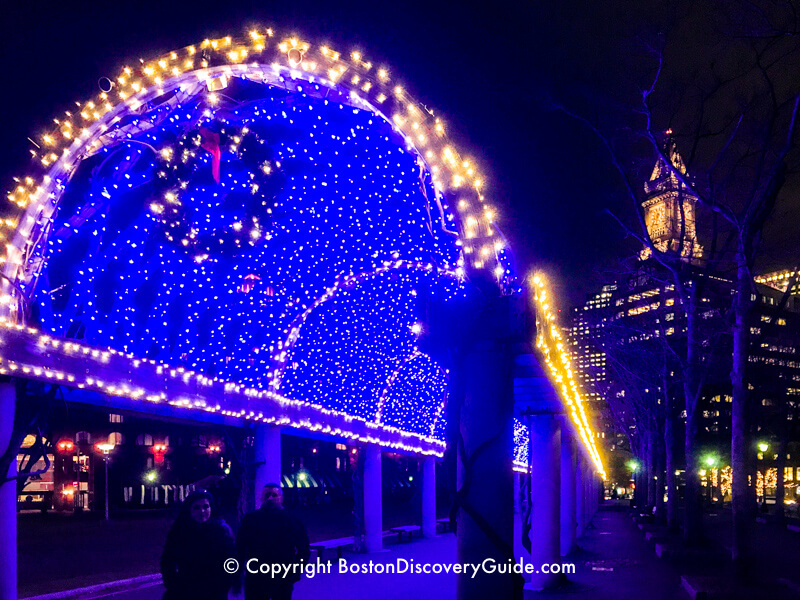 The Mayor turns on the 50,000 glowing blue and white LED lights along the 260 foot trellis (shown in photo below) and 14 nearby trees on Monday, November 18, 5 pm in Christopher Columbus Park (110 Atlantic Ave), transforming the waterfront park into a magical light garden through the holiday season. The event includes music, entertainment, and refreshments. 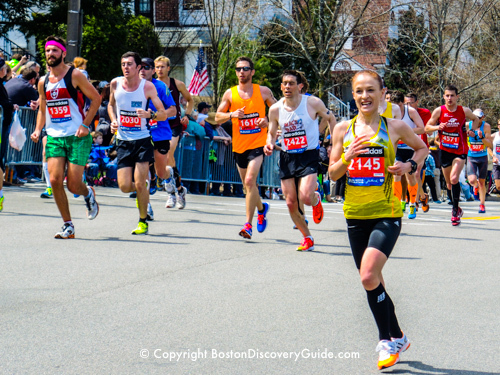 More to do: Don't miss this chance to have dinner in the North End! You'll find most restaurants along Salem and Hanover Streets. Friday, November 22, 5pm - Macy's (450 Washington Street) lights up Boston's Downtown Crossing this year on Black Friday when the festive evergreen trees on the Summer Street side of the store light up and the store's famous holiday window displays are unveiled. Look for Santa and his Elves, as well as entertainment from the Boston Children's Choir and other performers. Starting at 2pm prior to the Christmas tree lighting, stop by Macy's Children's Department with your family to pose for photos with Santa. More to do: Shop at Macy's, of course! 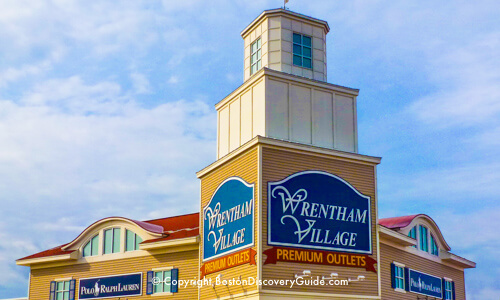 Explore all the new shops around Downtown Crossing, and then head to one of the many nearby Theatre District restaurants for dinner or take in a show. Monday, November 25, 5pm-6pm - Wreaths with red bows decorate Copley Square, and the Old South Church bell tolls when the lights on the Copley Square tree go on - look for appearances by Santa, Rudolph, and Frosty, plus live music by local groups including the Boston Pops Brass Quintet. More to do: Get a head start on your holiday shopping - check out the national-brand stores along Boylston Street or explore boutiques and galleries on nearby Newbury Street. A giant Christmas tree in the Rotunda lights up in the annual tree lighting event ceremony at 5pm on Tuesday, November 26. 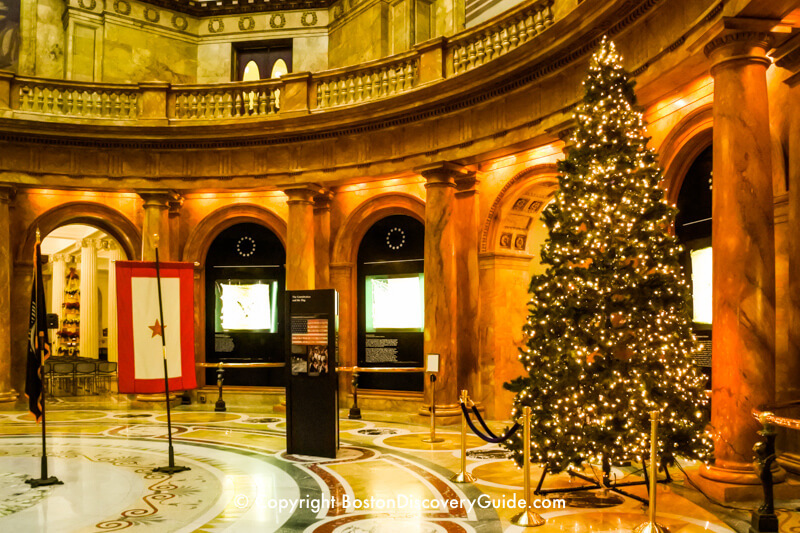 This marks the official kick-off of the holiday season in Massachusetts. broadcast by CBS Boston WBZ-TV at 7:30pm. Starting on November 27, the Marketplace begins its annual Blink! music/light show featuring 6 new songs this year. 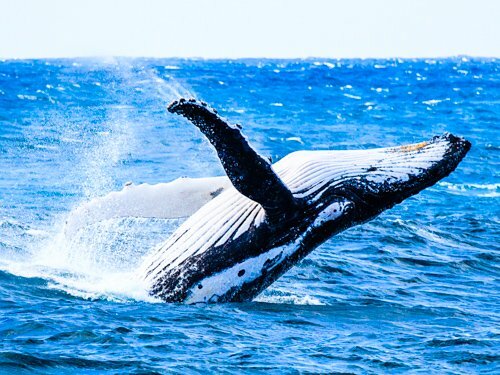 The show runs daily on the half-hour from 4:30pm-10pm through January 1. More to do nearby: Get all your holiday shopping done and enjoy the holiday performers at Faneuil Hall Marketplace. Take a selfie with Santa between November 23 and January 1 as he strolls around the Marketplace. Relax at one of the historic taverns along nearby Union Street. Thursday, November 21, from 6pm-8pm. 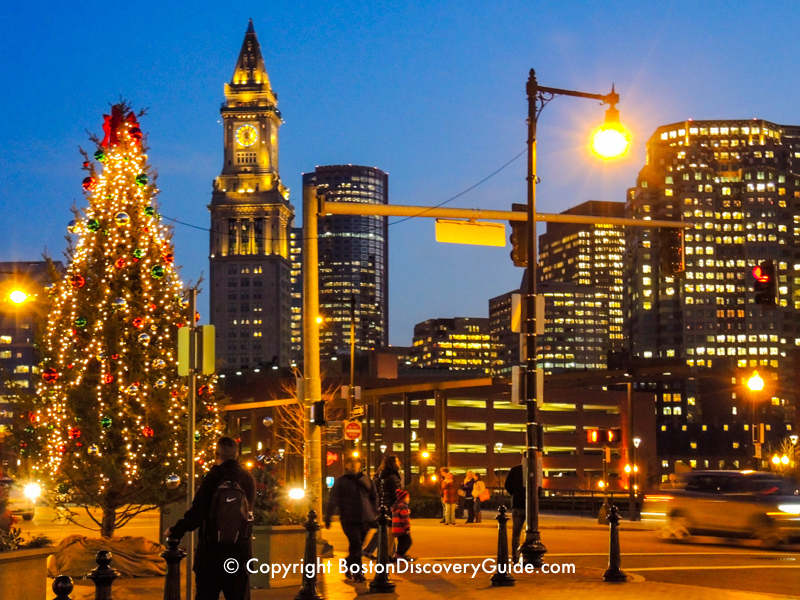 This exciting event takes place near the Visitors Information Center on Tremont St and stars the special tree sent as a gift from Nova Scotia (shown in photo at top of page). The Mayor will be joined by Santa and members of the Royal Canadian Mounted Police. Refreshments, music, and entertainment will be provided by local groups. Lights on the tree - almost 7,000 of them - go on at about 7:55pm, followed by lights on 80+ other trees throughout the Common and the Public Garden. 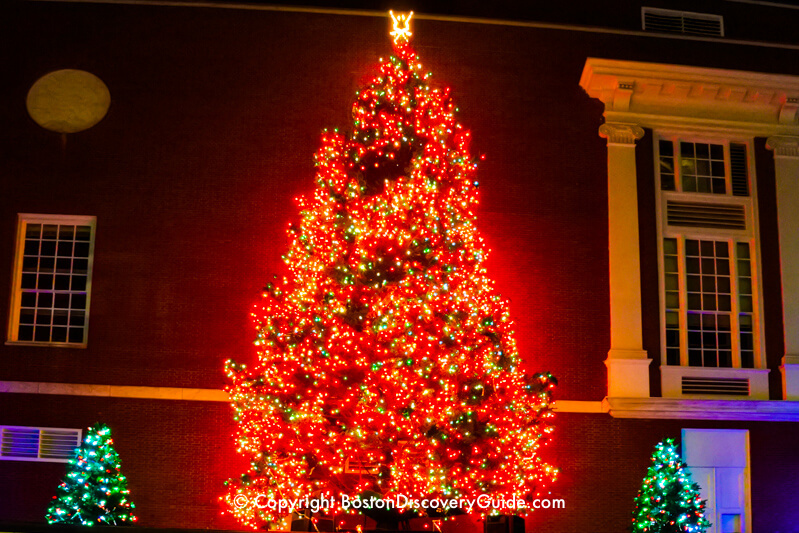 When the Mayor turns on the lights, the Boston holiday season officially begins! The show closes with a special fireworks display over the Common. 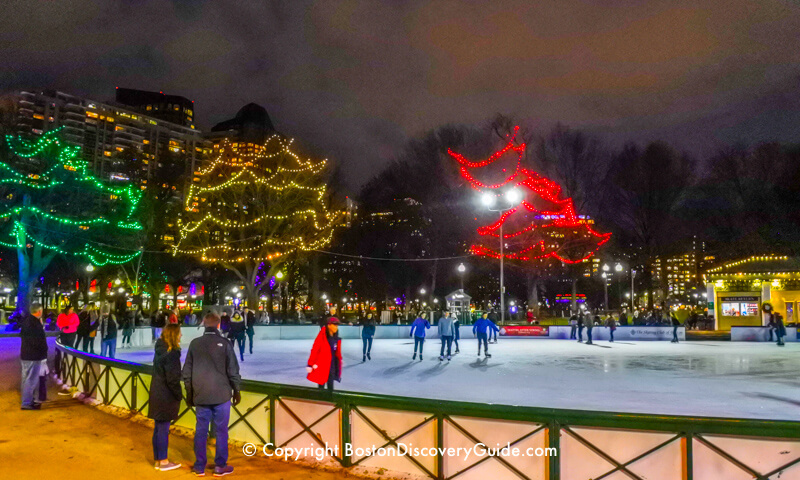 Before the lighting event, a free ice-skating show featuring Theatre on Ice of Boston, national and international competitive skaters, and Team Excel Synchronized takes place at Frog Pond from 5pm-6pm. Thursday, November 21, from 6pm-8pm. 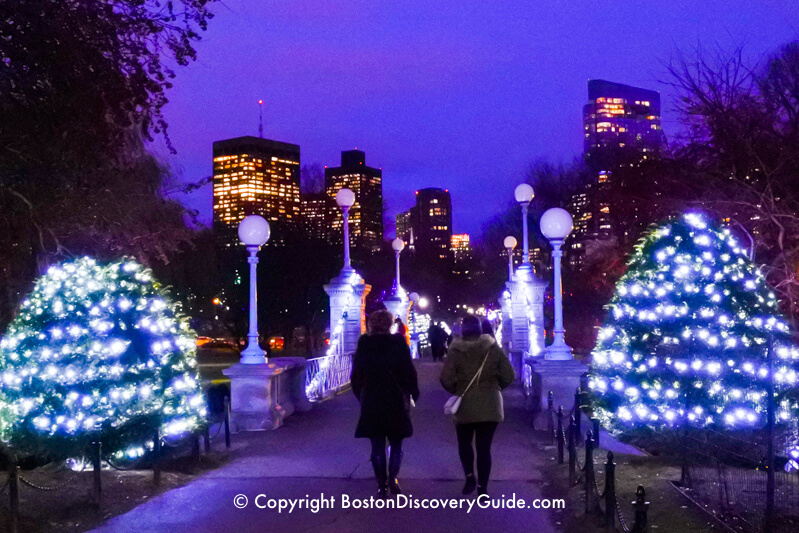 Right after the brilliantly colored lights on Boston Common go on, so do the white holiday lights covering many of the Public Garden's formally-sheared evergreen, giving an ethereal snowball effect across the entire park. Don't miss the experience of walking through the Garden in the evening after the lights come on. Thursday, November 21, 8:30pm - Thousands of sparkling gold lights transform this tree-filled parkway into an enchanting forest. Friday, November 29, 6pm - 8pm - Gather on Seaport Common (85 Northern Ave) for live music, treats from nearby restaurants, and various give-aways, and then see the Christmas tree lighting. Stop by District Hall (75 Northern Ave) for kids' activities, a photo exhibit, and a cash bar for adults. From December 1 through New Year's Eve on December 31, Prudential Tower displays lights of a different color each night to bring awareness to non-profit organizations. It's one of Boston's special holiday traditions! Friday, November 29, 6pm-8pm, at the corner of Cross and Hanover Streets. Come hear carolers and enjoy some light refreshments from Caffé Paradiso and the St John's Chool Bake Sale (all proceeds benefit the school's programs). The North End's Holiday Stroll takes place this evening too! 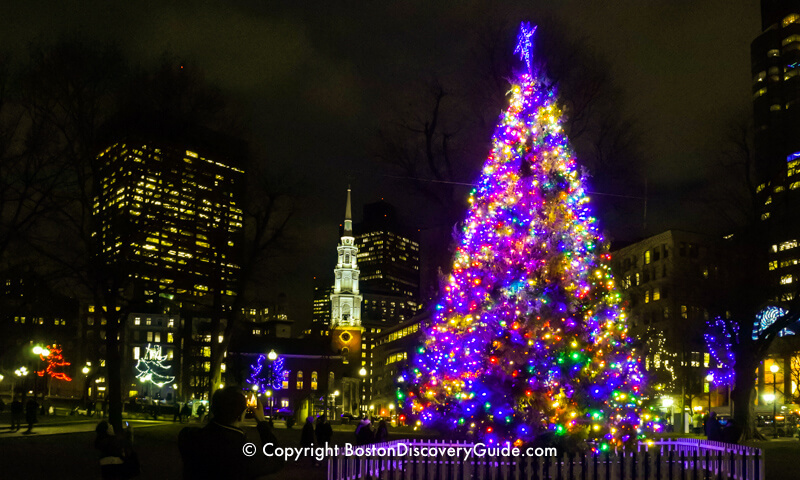 The schedule for Boston's Christmas tree lighting ceremonies doesn't usually get finalized until around mid-October each year. If you want to plan ahead to attend one or more of these ceremonies before the final schedule is available, here's a tip: ceremonies usually take place on the same day of the week from one year to the next, so you can use the previous year's date to reasonably guess when the date for the next year. However ... keep in mind, there are no guarantees, even once dates are set. 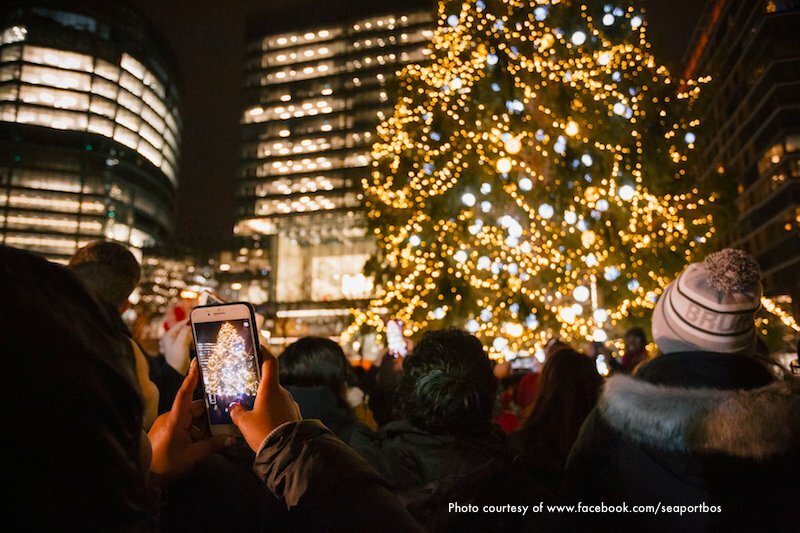 So please note: Dates and times for tree lighting ceremonies are always subject to change and even last-minute cancellations, particularly if we get hit by extreme weather (ie, nor'easters, blizzards, etc.). Please verify dates and times close to the events.